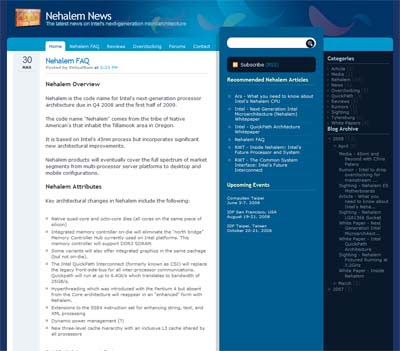 I've just launched a new blog site that will capture information and news from around the web related to Intel's upcoming Nehalem microprocessor. For those that don't know, Nehalem promises to be the most innovative CPU from Intel in over a decade (since the Pentium Pro). For the first time, an Intel CPU will include an on-die memory controller offering superior memory bandwidth and dramatically reduced latency. The Nehalem News blog will link to news, information, reviews, and overclocking tips and results from around the web. Check it out and post some comments in the related forums! I'm honored that my recent PC project, RainMaker has been featured on the ultra-exclusive showcase site, Million-Dollar-PC.com. In the words of the MDPC founders... "Million-Dollar-PC.com (MDPC) is a collection & gallery of some of the world's most beautiful computer systems." What a privilege and an honor! Thanks MDPC! Project RainMaker, is my latest home PC build project. It was an incredibly ambitious project, and as a result, took me nearly a year to complete. It employs water cooling on every major component in the system including: CPU, Graphics Cards, Chipset, Mosfets, Power supplies, and the PhysX processor as well. 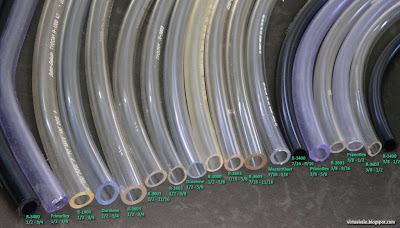 The water cooling is implemented in three separate loops to provide for maximum cooling performance and therefore maximum overclock headroom on all components. After several months of putting the polishing touches on this project, I've finally got around to annotating some of the pics I took during the build for those of you who might be interested in seeing something a bit different with a Lian-Li PC-343B Cube Case. The key mod I've made here is in converting the motherboard tray to a horizontal configuration and implementing the aforementioned cooling system in a fairly unique manner. 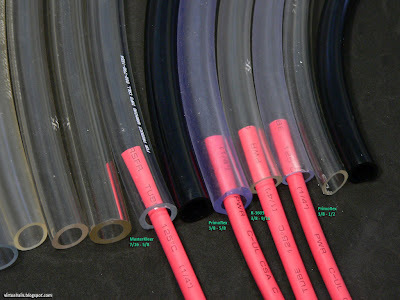 Build a completed system that was as good if not better than something a custom mod shop would build or a high-end system builder in terms of aesthetics, servicability, and modularity. I recently picked up an AC power meter and set about measuring the power consumption of Project RainMaker's bench setup (quad-core system) as well as my old AMD X2 system. The results were surprising! For graphics cards, I have an old POS MX4000 PCI card (seen lying on the anti-static mat above) and my recently purchased volt modded 8800GTX (installed in the pic above). I tried the power draw with both cards as you can see below. 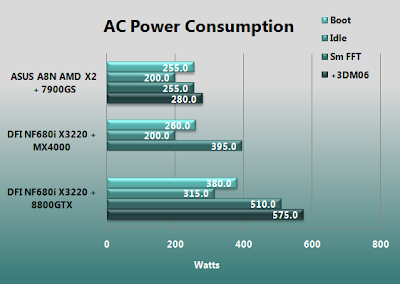 I also tested the power consumption of my 2-year old 24/7 AMD X2 system with 7900GS for comparison. 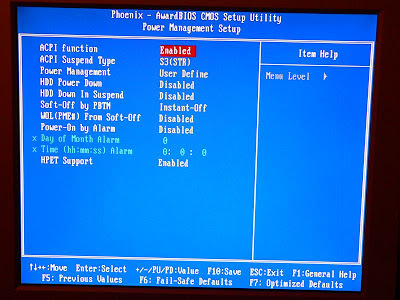 Boot: The maximum observed power draw while turning the system on and booting Vista. FYI... The maximum draw appears to be when the graphics drivers load in Vista after the scrolling progress bars disappear. Idle: This is the draw after Vista has booted and all HD activity has stopped. Sm FFT: This is loading all cores (2 on the AMD System and 4 on the X3220) with PRIME 25.2 Small FFT. Max power draw remains steady and doesn't fluctuate at all during this test. +3DM06: While continuing to run PRIME in the background, I launched 3DM06. The max power draw I observed was during the initial graphics sequence where everyone is still in the landing ship. The rest of the time, the power consumption may be lower by 10-20W. I could not run this test on the POS MX4000. Given that Jonny has measured the efficiency of this Corsair PSU at about 80%, and the peak AC draw with the 8800GTX was 575W, that means the PSU was delivering about 460W DC. That's alot! The 8800GTX adds an additional AC draw of 115W (92W DC) over a mundane GPU even when it's not doing ANYTHING. I haven't even started to leverage the volt mods and overclocking much yet. Although I should point out that the BIOS currently on my 8800GTX does not have 2D clock settings so the core and shader are running at full speed which obviuosly increases the power draw during idle. Given that the final system will include 4 raptors, an Areca RAID card, an X-Fi, another cooling loop with DDC pump, and misc. lighting, there is no doubt that a 500+W PSU is NOT up to the task. While my new quad-core system is at least double (if not triple) the performance of my old AMD system, it doesn't come cheap... It consumes over double the power at load! 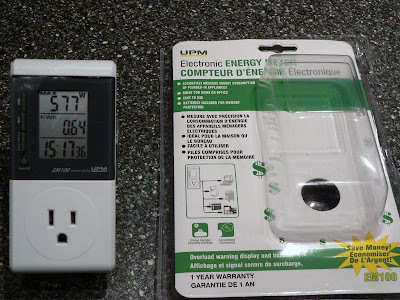 If you are interested in what I used to test... it's a simple energy meter purchased at Canadian Tire for $25, similar to the Killawatt device that's ubiquitious in the US. It stores the max power and current, includes an overload warning, a feature to set and monitor energy costs and a battery function to maintain collected data even after it's disconnected from the power. This article will be an ongoing list of tips, tricks, and known issues related to the DFI NF680i LT motherboard and overclocking the NVIDIA 680i in general. It is compiled from forums that I frequent. I'll keep this blog post as up to date as I can. Please comment on any further tips, issues, or inaccuracies please! 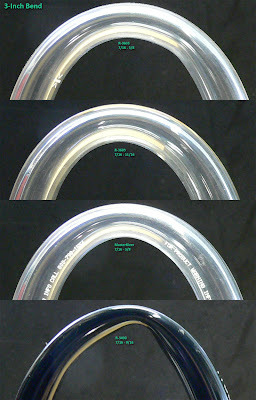 Can be found on the TheTechRepository.com. 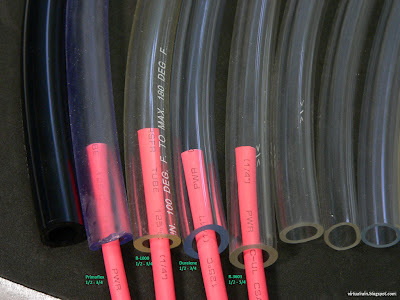 If you are overclocking a quad-core, then Kris' article on GTL at the TTR is essential reading also. Note that the GTL reference voltage settings are mis-labeled in BIOS... the three settings are actually for CPU Core 0/1; CPU Core 2/3; and NB. There is some information on the Club Forums as to how the GTL values may translate into real-world values. Tony and Kris also have a lot of excellent articles on memory overclocking, straps, 1T vs. 2T, GTL, etc. Check them out. A comprehensive thread with links to a lot of relevant articles and information can be found as a sticky on the DFI Club Forums. 1) Do not disable EBD and VT in cpu feature. 2) NB and PWM must have active cooling, especially when running Quad-Core. 3) When running C2D, you do not have to change the GTL settings. 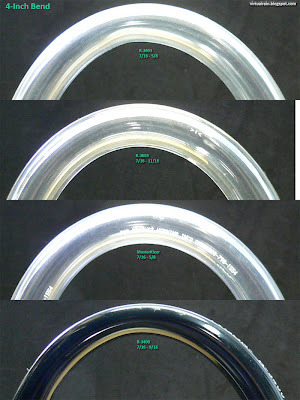 4) See the thread for info on his GTL and voltage settings. I noticed that the difference between BSELECT 6 & 7 (or 350 and 350 cpu strap respectively) is that 6 is locked on 350 and 7 is 350 but also somehow automatically adjusts internal chipset latencies as the fsb rises. 6 does not. You need to use 7 or Auto for fsb's far above 350. I have not been able to boot with anything else. Voltage changes on the NB change latencies on the chip making RAM and other chipset related things change in performance. I bench 11733 READ in everest with 1.39v NB and 9700~ with 1.30v. The more voltage you give it, the higher it performs. It has still been unnecessary for me to go above 1.42 for stability. Remove all but one stick of RAM, clear the cmos and upon the first boot, hold the power button for a little bit longer than normal (about 2 seconds). This will usually work for me. 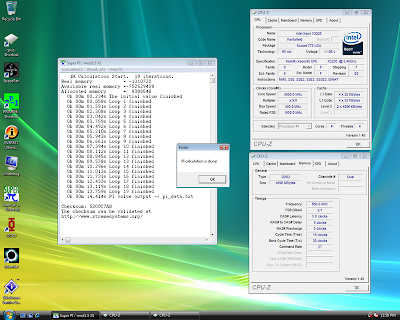 NOTE: On my processor/board BSEL has no effect on performance except that BSEL7 will not boot. - As always bandwith depenpends on cup multiplier / strap - for my QX6700 the sweat spot seems to be 11x - do some testing with your cpu by comparing everest mem read. NOTE: I was not able to gain anything by using the yellow slots with my memory. See my related article. Not sure why this isn't in the manual but the post codes are here on the DFI Club Forums. With BIOS settings at default, even with C1E disabled, Vista will want to utilize speed stepping to down-clock your CPU when idle. 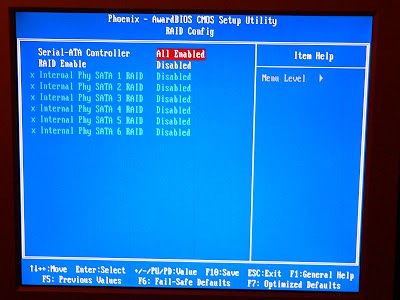 You can stop Vista from doing this by setting your power profile to "High Performance" in Control Panel > Power Options. 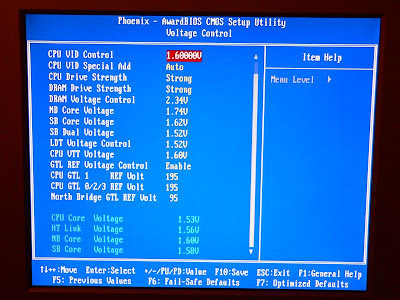 Flytek was kind enough to provide a picture showing the necessary DMM measurement points for vDimm and vCore on this board. Be careful and poke your board with DMM probes at your own risk! The pic can be found in his post on Xtremesystems. Using the DMM measurement points above, I measured both CPU VID and VDimm and found that although what you set is NOT what you get, the BIOS readings at the bottom of the Voltage settings screen are accurate. I also compared NB voltages settings to BIOS readings and found a consistent 0.12V droop at all mid-range NB voltage settings. This is significant as the NB voltage setting is very misleading. 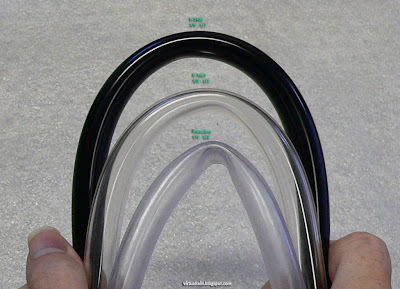 Full measurements can be found near the bottom of this page. Ensure the PWM area is getting good airflow. This has been causing lots of issues for people overclocking. Jobeo got a Tuniq Tower fitted on his board complete with the audio module and stock NB heat sink (but as he mentions, be sure to fit those components first). See his thread on the DFI Club Forums. For the NB Heatsink, only use a TINY amount of TIM if any at all. 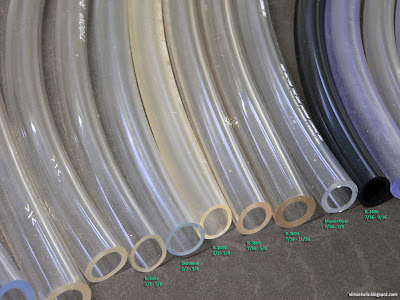 The surface of the silicon is glass smooth and the area is so small that only a pin-head of TIM is really required. Most agree that the best orientation of the NB heatsink is to mount it such that the upright portion is closest to the CPU stocket instead of the PCIE socket. 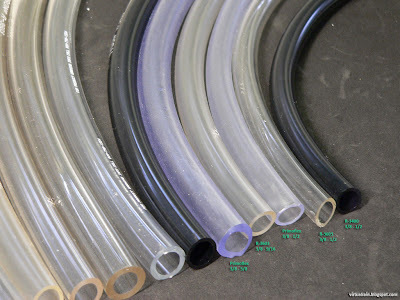 This ensures the heat pipes terminate directly above the NB chip. If you are looking for a fan to clip on to the stock NB heatsink... the clips are designed for a 60x60x10+mm fan (a 10mm is a bit too loose and a 15mm is simply too thick to use with the stock clips). Pics and info here on the DFI Club Forums. 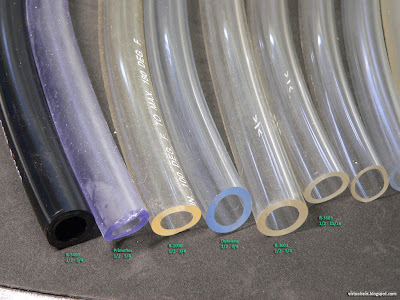 More info on air cooling alternatives in this thread at the Club Forums. - Mine must have been stuck on wrong then as my triangle bit was near the PCI-E slot & if you fitted the heatsink tower to PCI-E slot the you ended up with a triple foam pad thickness PCI-E side & double on the CPU side. - I took my triangle off & tested the board & I then realised the 680 chip is not in the centre of the 4 hook mounting but rather its off centre toward the CPU socket & logically I figured the NB heatsink heatpipe would be better over the chip than off to the side so I rotated the heatsink. - My temps are way better tower to CPU socket rather than tower to PCI-E. 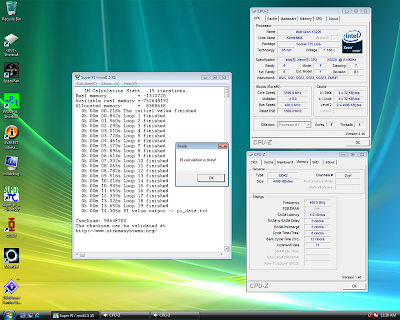 NOTE: Normal NB Temps while overclocking should be around 50-deg. MIPS has an excellent set of water blocks specifically designed for this board. The Swiftech MCW-30 will also fit on both the SB and NB although tube torque may cause it to perform poorly by tilting the block off the surface of the NB. Be sure to use a shim or at least keep the padded stock shim in place to reduce this as much as possible and avoide having the block short out one of the adjacent surface mount components. If you are considering an aftermarket NB/SB heat sink or water block, The NB uses loops which form a square that is 50x60mm. The MCW-30 will fit on the NB using the supplied wire-clip hooks. 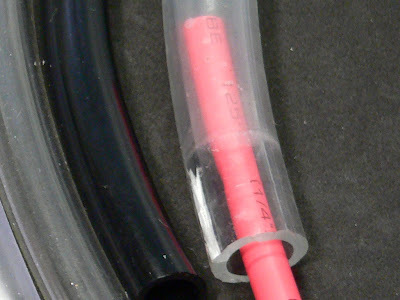 The SB uses push pins which have a center-to-center distance of 53mm. The MCW-30 will also fit on here without interferring with either adjacent x16 PEG slot. 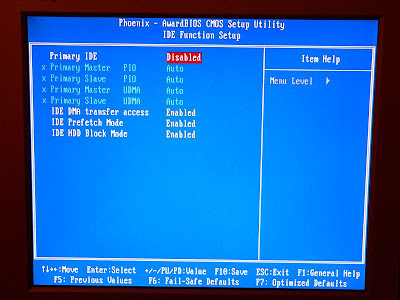 It's important to note that you should NOT load previous bios settings from CMOS Reloaded after flashing the BIOS. 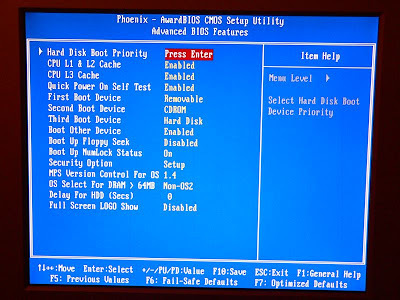 The old settings may not map to the new BIOS correctly resulting in unwanted effects and possible damage. Make sure you copy your favorite settings down before flashing so you can reset them. At this time, Winflash does not work on Vista x64. It throws an error saying "Onboard BIOS not Award BIOS". 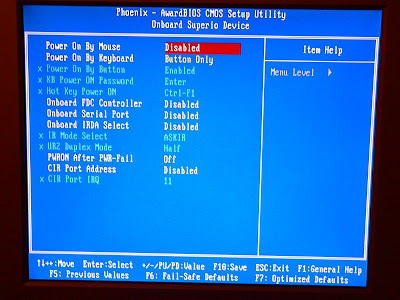 You can flash the BIOS using a floppy or using a bootable USB flash stick. 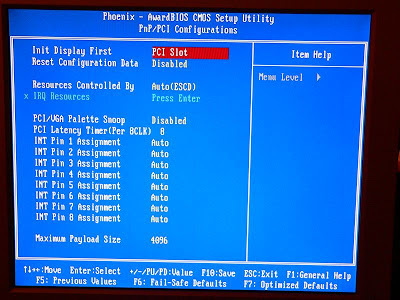 If using a USB flash stick, be sure to edit the autoexec.bat file that accompanies the BIOS file and flash utility to set (or simply remove) the drive/path reference to AWDFLASH. There is an automatic temperature shutdown feature in BIOS called "Shutdown Temperature" under the PC Health Status section of BIOS. This temperature corresponds to the first temperature reported by Speedfan (Temp1). 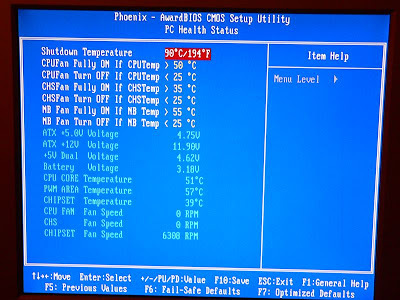 If this temperature reaches the value set in BIOS, the board will shut itself off. You may misinterpret this as a crash... this is not the case! I've found with my quad-core at high OC while stress testing with small FFT's that I can easily hit the default BIOS shutdown temperature after 5-10 minutes. Simply increasing it a notch or disabiling it while stress testing is all that's needed. Be sure to set it back later so you can protect your CPU from damage. 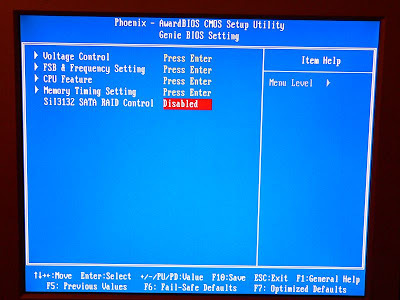 In the 521 Beta BIOS this option is disabled by default. - Lack of adequate cooling on the PWM heatsink has been known to cause hard shutdowns under severe loads. Ensure that your CPU heat sink is not significantly warping the motherboard causing the PWM heat sink to loose contact with the underlying components... either add some additional TIM, thermal pads, or ideally get a backplate if you are using an aftermarket cooler. BIOS, Speedfan, and SmartGaurdian all pull monitoring values from the ITE SuperIO Chip the IT8712F which includes voltages and a few temps (CPU, NB, and SB). Note that the temp in BIOS called "PWM Area" is mislabled... this is actually the NB temp. This has been fixed in the 521 Beta BIOS. The CPU temp pulled from the IO chip should not be trusted... CoreTemp is the best source of true CPU temps. Both Everest and Speedfan also pull the same data from the same registers as CoreTemp so you can use Speedfan or Everest to do the same thing. With Speedfan, you simply need to add a 15-deg C offset to the reported values to make them match with Coretemp (it's built-in offset is not correct but the values from the registers are). Speedfan can see Vcore, the HT Voltage, and the NB Voltage but initially displays them as Vcore1, Vcore2, and 3.3V... simply rename them with the proper labels. 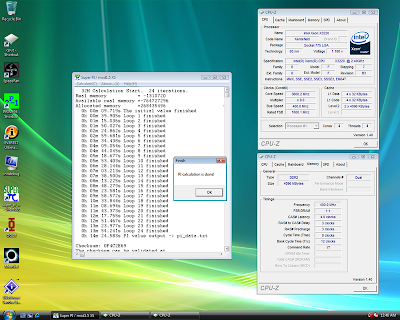 Unfortunatly Speedfan current doesn't seem to report the VDimm or SB Voltage, but not a big deal. It also can't control the fans which is a shame... you need SmartGaurdian for that (why is it so damn ugly!). SmartGuardian's "Chipset" is actually the NB temp while "System" is the SB temp. Hopefully a future version of Speedfan will offer more comprehensive monitoring of this board. I've logged an issue with the developer of Speedfan. Although the DFI boad is completely different from the EVGA product, this article may have some relevant information for you as background if nothing else. It can be found here on the EVGA forums. This guide was compiled by a Danish fellow affiliated with www.hwt.dk known around XS as Illuminati. Illuminati also compiled this excellent RAM Timings guide for 680i overclockers... available on XtremeSystems.org or on the EVGA forums. Again, this guide was crafted with the EVGA board in mind, but the information may be relevant for DFI boards as well. This article is also based on a board other than the DFI, in this case the ASUS P5N32-E SLI, and may also be of limited use to DFI owners. At any rate, some information here may be relevant. A lot of people (including those with EVGA boards) report having trouble with BSOD during Vista x64 installation with 4GB of RAM. This happened to me also. It turns out this is an issue with Vista and there is a patch available. More info is available in MS KB article 929777. A work around is to remove memory from the board so you have 2GB or less when installing Vista x64, then apply the patch after installation before adding back your additional RAM. Kudo's to "nugzo" on XS for pointing this out. 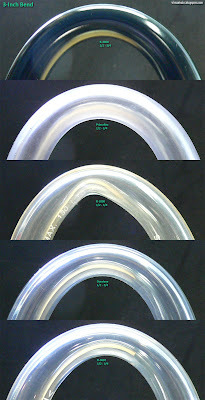 If anyone has solutions or work-arounds for these, please comment. There may be a problem with RAID performance (with this board and/or 680I chipsets in general). It needs to be tested by more people before we can conclude anything, but Raju's initial test was not showing great performance. Something appears to be limiting throughput. One person could not post with the Enermax Galaxy 1000W PSU (EGX1000EWL). Confirmation here. At least one other person has had no problems with this PSU and board combination. UPDATE: It appears the 4+4 connector is the one to use... the 8-pin ATX connector can cause a no-post condition as reported on XtremeSystems. Currently nTune is not able to read a variety of voltages and some system bus information from this board. Currently only CoreTemp can be trusted. There are apparently issues with SmartGuardian and even DFI's own BIOS reading. Everest works but the values are labeled incorrectly. Since Speedfan also supports CoreTemp you can use it (although it will require offset adjustments as noted below). 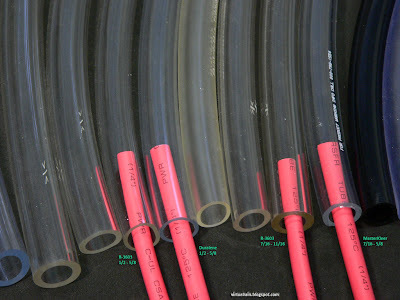 Speedfan's core temperatures need to be corrected by 15-deg. C to match CoreTemp. Speedfan does not report the CPU fan speed correctly. It also does not report other fan's correctly, nor can it control fans (use SmartGuardian for fan control). 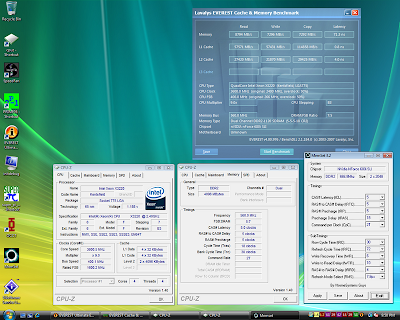 The temperatures reported by Speedfan are in this order: CPU (? ), NB, SB, ACPI (useless), Core Temps. Voltages are (in order) Vcore, HT, NB, and then as labeled. At this time, Winflash does not work in Vista x64. It throws an error saying "Onboard BIOS not Award BIOS". Prior to the 521 Beta Bios there is no option to adjust multi's on non-extreme quads or access multi's above 10 on extreme processors. This has been fixed in the 521 Beta BIOS... Use 2CTST for non-extreme processors (including Q6600) and the 4CTST for all extreme processors. I've found that the BIOS voltage settings (particularly at more extreme values) consistently undervolt significantly. 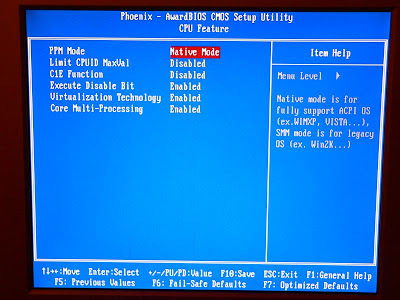 For example, setting CPU VID to 1.60V in BIOS will actually translate to 1.53V. Setting NB Core to 1.6V results in 1.47V. Don't just assume that what you set is what you get. Check out this screen shot for an example of what I mean. Update: I compared NB voltages settings to BIOS readings and found a consistent 0.12V undervolt at all mid-range NB voltage settings. 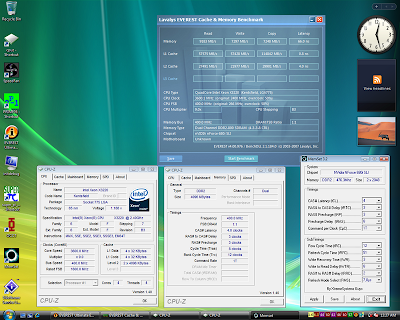 Overall, BIOS readings and Speedfan/SmartGaurdian are close enough to actual Voltages to consider them legit. Again, BIOS readings are close to actual. 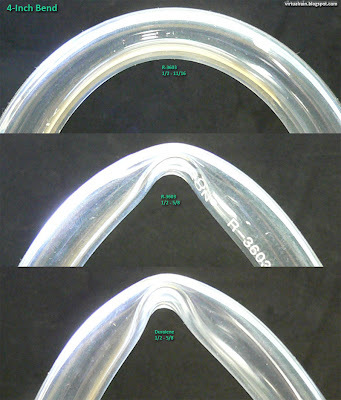 Droop under load is about 0.01V. There is a consistent undervolt of 0.12V on the NB... If the BIOS reading is correct (as it was with Vcore and Vdimm above) then this is very misleading... keep this in mind when overclocking to a high FSB. One user on XS has fried his RAM and board after clearing CMOS using the jumper... it came back from CMOS clear with VDimm at 3.04V. People have had consistent success using the reset/power switch to clear CMOS rather than the jumper. Perhaps using this technique can help save BIOS issues like this. YMMV. If you are experiencing C1E throttling with your CPU, and have C1E and power profiles disabled (Vista) then you may want to check out this thread at DFI Club as the problem is still open as of the last update to this blog post. 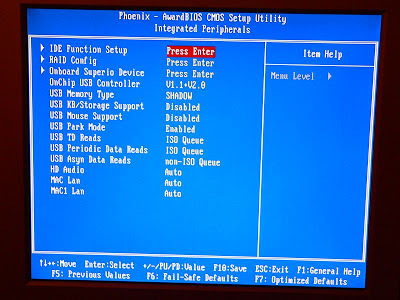 This is a list of BIOS changes that have been reported informally by users. Moved to non-BETA status on June 6th. The 2CTST version should be used with all non-extreme processors (including Q6600) while the 4CTST version should be used with Extreme processors. - Multi option is now available for both non-extreme quads and extreme processors. No performance improvements have been reported with this BIOS. Strangely, I could not get the board to POST with the RAM running at 1T in the yellow slots. At 1100MHz running 2T command rate, there was no difference between the yellow and orange slots with my memory. Oddly, when switching RAM between slots, the board requires a CMOS clear to POST. Then after adjusting settings (loading from cmos reloaded profiles for example) and rebooting, it would hang on POST code #75 for 2 minutes before rebooting normally. I'm not sure why it does this, but be patient when it appears hung. 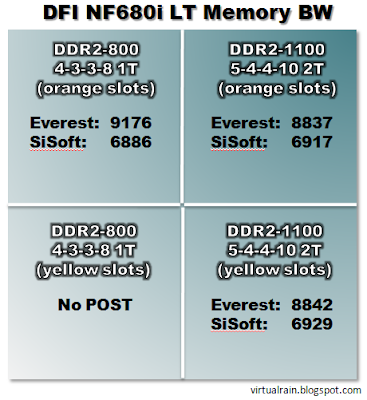 As noted in my earlier memory overclocking article, 1T is marginally faster at 800MHz than 2T at 1100MHz (at least according to Everest... Sisoft Sandra has 1T slightly slower). 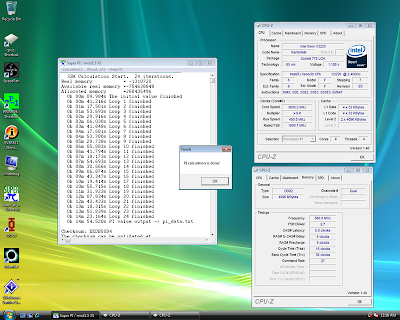 I recently spent some time overclocking my Mushkin PC2-8500 2x2GB sticks on the DFI NF680i LT. Given my current max stable overclock is at 400x8, I decided to try and get the lowest latency at 1T that was possible at a 1:1 DDR2-800 speed and then focus on using unlinked mode to get the highest MHz possible out of this RAM at a 2T command rate. 4GB vs 2GB: I was expecting the 4GB kit to be much less cooperative than a typical 2GB kit, but I was pleasantly surprised that at max rated voltage of 2.3V, this RAM can both run well at low latency at 1T and high MHz at 2T with relative ease. Vista x64 loves RAM and it's working smoothly so far. 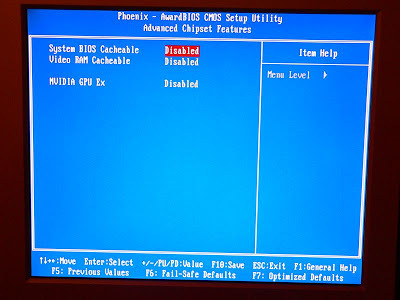 The only hiccup I had was during the Vista x64 install... See my Tips/Tricks article for more info. 1T vs T2: As you will see, 800MHz at 1T is faster than 1120MHz at 2T. I could maintain 1T at 2.3V up to 900MHz but the performance suffered running out of sync. 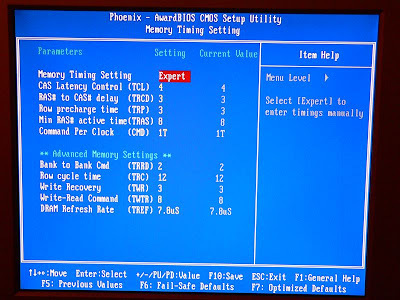 I really need a BIOS that allows me to set the x8 multi on my X3220 so I can try to run 450x8 and increase memory performance by running 1T at 900MHz. CAS: Even increasing the voltage above rated values would not allow the machine to POST with CAS3 with this RAM. CAS4 is the sweet spot for low-latency... CAS5 at high MHz. Testing: Memtest+ 1.7 is a great tool for testing RAM, but it takes about 45 minutes to do a full pass with 4GB. As a rule of thumb, I always test any RAM overclock with a pass of Memtest before booting Windows and have never had a corrupt OS as a result. Of course, once in Windows, Super Pi and Everest are great quick benchmarking tools. Voltage: As with most Voltage settings in BIOS on the DFI NF680i LT, the DRAM Voltage needs to be set higher than actual... usually by 2 steps... that is on my machine setting 2.38 = 2.30 actual. Under load Vdimm will only droop about 0.01V. I verified SmartGuardian with my DMM and it was usually within 0.01V as well. From CAS 5 to 4 results change ~5-10mb/s. The same change will most likely be seen when going to CAS 3. This timing is widely seen as most important (Command rate disregarded). 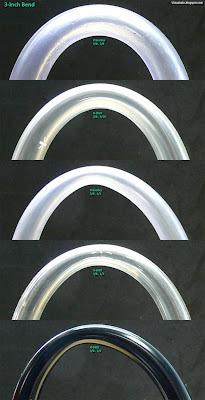 Recommendation: 4 for normal usage, 5 when oc'ing. Tweaked: 3.
tRCD going from 4 to 3 gives ~15mb/s. From 5 to 4 also yields 10-15mb/s. This timing is considered second important after CAS, but actually it's more important on 680i/DDR2. 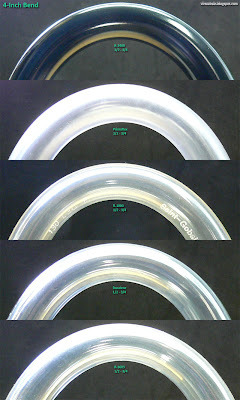 Results vary close to nothing when changing from 3 to 4 to 5. Still this timing needs to finish its cycle before a new one starts, so dont set it higher than 5.
tRAS seems to act differently on integer/float results. Integer, going from 15 to 10 changes by ~5mb/s. Float doesnt change. tRAS is an "end-timing", so dont go to high. And not lower than what tCL+tRCD equals. tRRD of 2 didnt change the results. Nor did a tRRD of 4. This is a delay-timing so a too low value may result in recalculation. This timing is quite surprising. Going from 30 to 21 gave ~90mb/s. From 23 to 21 gave ~15-20mb/s. tRC is last timing before ram burst (data transfer). Dont set too high. And tRC should be greater than tRAS + tRP or you might get corruption. Small change from 6 to 3. Setting timing too low will cause ram to fail switching to "read mode". From 10 to 8 didnt change results. 6 would lock up the system. This timing gives no bonus but affects stability a lot. Use with care. Changing to 3,9us didnt show improvements in benchmark. It also didnt seem to affect stability. tREF was important with DDR1. Settings are 2T/1T. You probably already know a lot about this timing. The 680i struggles running 1T above 800mhz. So do the ram - atleast 2,2v are needed. This timing gives a great boost to bandwidth, but is fairly hard to attain. I wont recommend any setting regarding this timing. You need to find what mhz you get with 1T, then find mhz with 2T, then compare benchmarks. An interesting fact is that my stable GTL settings are radically different from the recommended values. I initially discovered this by accident... I originally tried a GTL 2/3 value similar to GTL 0/1 out of frustration and thinking (now erroneously) that perhaps the two GTL settings should be similar. Later, when I was trying to get Vista to boot at 3.8GHz for fun, I tried every GTL value (changing by 10 and then 5 and then 2) to narrow in on GTL values that would just allow Vista to boot at 3.8GHz... this reinforced my earlier findings... at high FSB overclocks, GTL 2/3 for me had to be close to GTL 0/1. While I'm certain this is not the case for others, it definitely worked out for my particular CPU/board combo. My situation is most certainly an endorsement for having GTL tuning... since without the ability to tweak GTL values significantly like this, I would not have been able to make this overclock stable. Although without another board without GTL tuning (i.e. the EVGA 680i) to evaluate this theory, I will never really know for sure. 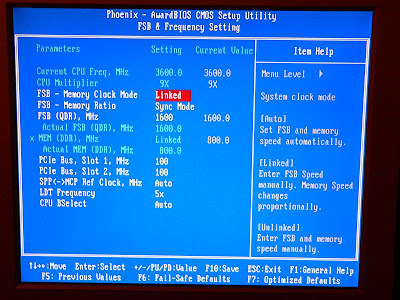 In some cases, there is a significant difference between what is set in BIOS and the actual voltage. The NB is particularly bad as it is off about 0.12V at most settings. Note that water cooling is essential for running these kinds of voltages on a quad-core.